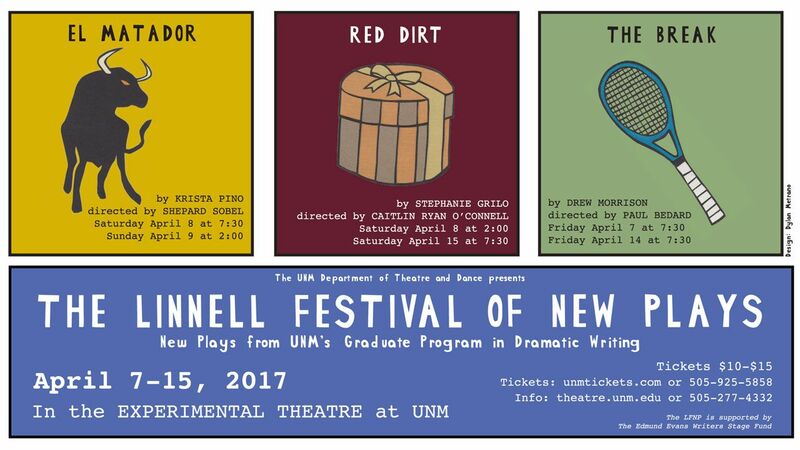 UNM’s Department of Theatre and Dance presents the 2017 Linnell Festival of New Plays at the Experimental Theatre on UNM’s main campus from April 7 through 15. 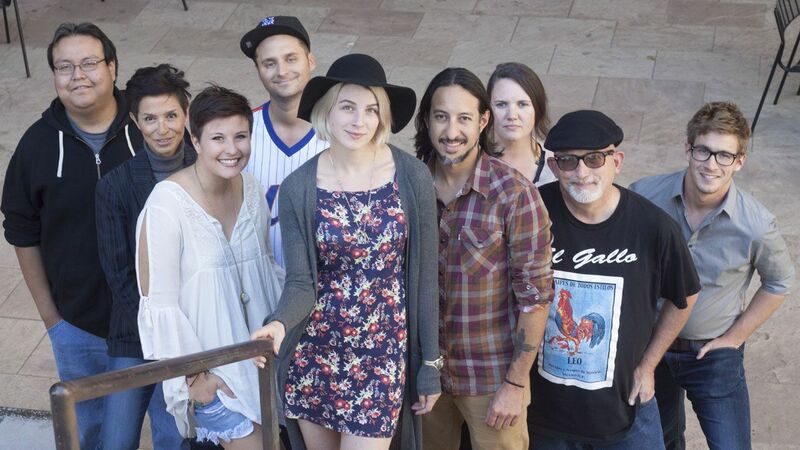 The Linnell Festival is the Centerpiece of UNM’s Award Winning Dramatic Writing Program. The Linnell Festival of New Plays at UNM provides audiences the opportunity to play a vital role in the continuing development of these exciting new voices, as they step from their academic program towards the professional stage, supported by an outstanding team of directors, actors, designers, and technicians. Tickets are $15 general, $12 seniors and UNM faculty, $10 students and UNM staff. The Break: April 7 & 14 at 7:30 p.m.
Red Dirt: April 8 at 2 p.m. and April 15 at 7:30 p.m.
El Matador: April 8 at 7:30 p.m. and April 9 at 2 p.m.
All readings are free admission. Tickets can be purchased at the UNM Ticket Offices or online at UNM tickets, or call 925-5858 or 1-877-664-8661. For more info visit UNM’s Department of Theatre and Dance website or call 505-277-4332. The Break by Drew Morrison, directed by Paul Bedard; Red Dirt by Stephanie Grilo, directed by Caitlin Ryan O’Connell; and El Matador, by Krista Pino, directed by Shephard Sobel, will be presented as part of the 2017 Linnell Festival of New Plays. The fully-staged world premiers are all written by third year MFA Dramatic Writing students at UNM. This year’s festival also includes directed readings of new works by second year MFA playwrights Caroline Graham, Monica Sanchez, and Diego Gomez, as well as a reading of a new play by first year MFA playwright Jay Muskett, and an evening of Screenplay Readings. The Break follows the story of Sadie as she grows from nine-year-old prodigy to tennis pro, and her relationship with her coach Jen, a former pro whose career mysteriously went down in flames. Spanning 20 years, The Break looks at what fame and the pressure to win do to the things we love. Third year MFA playwright Drew Morrison is also an actor and an associate member of Tricklock Company. Previous plays include Helen of Troy vs Grendel, Slow Dissolve and Welcome to Retroland. Most recently, his play Ingrid and Nurton, was performed at Farm Table restaurant as part of the Theatre on the Farm Festival. Red Dirt, by Stephanie Grilo, is set in Freedom, Okla., where life stands still. It is warm and humid. After her mother’s attempted suicide, Amaly Smallwood has been court-ordered to live with her estranged uncle and three teenage cousins; all boys. Inside their double wide and out in the oil fields, the Smallwood family collides head on with buried secrets, family violence, and uncanny sexual awakenings. Grilo is a native Texan and New Mexico transplant. Her plays include Red Dirt, Everly Heart and The Dollar and a Quarter Coast Ride, Will You be There, A Players Guide to Your Mid Twenties, and Nassau County. Grilo’s work has been developed by Blackout Theatre Company and Coffee and Whiskey Productions, among others. El Matador, by Krista Pino, follows the struggle of Ignacio as he explores what it means to be a man in a world where machismo is the expectation. Ignacio has always felt he should follow his father’s footsteps - into the bullring. Ignoring his mother Rosa’s constant reminders of the danger it presents, he follows his desire, emboldened by the passionate encouragement of his fiancé Karamia. Ignacio joins up with a questionable bookie, Rudulfo; a reputable, yet controversially female trainer, Tati; and an ornery bull, El Hefe. Ignacio’s passion for bullfighting unearths secrets about his family’s past and inspires a unique love story between bull and bullfighter. Pino graduated from UNM with a degree in Flamenco. Her passion for theater and dance is reflected in many of her projects. In addition to the interdisciplinary aspect, Pino explores social, political and cultural issues through her theatrical and cinematic works. As part of that “village” that it takes to develop these new works, The Linnell Festival partners emerging playwrights with established directors to bring these plays to the stage. The director for The Break is Paul Bedard, a New York City-based theater director and activist committed to a constant questioning of individual and collective identity. In 2015, Bedard served as a Drama League directing fellow at Ithaca's Hangar Theatre. There he directed Jean Cocteau's The Infernal Machine, Lynn Ahrens and Stephen Flaherty's The Emperor's New Clothes, and an experimental staging of the 1960 presidential debate between Richard Nixon and John F. Kennedy. 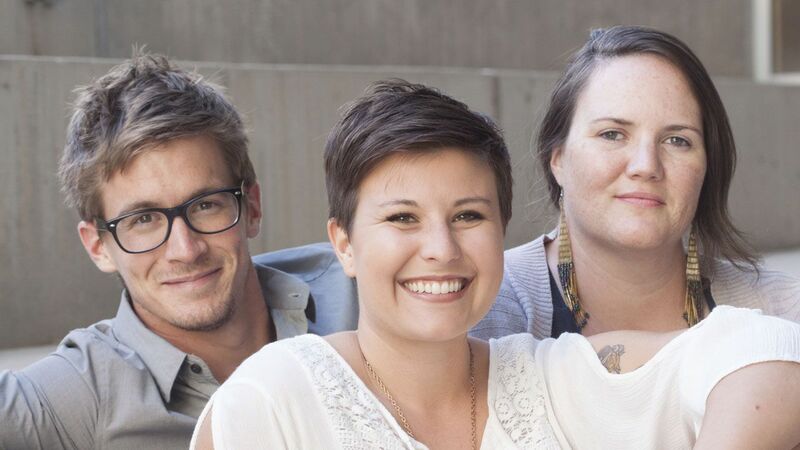 Caitlin Ryan O’Connell, a 2017 Clubbed Thumb Directing Fellow and a former directing apprentice at Actors Theatre of Louisville, is the director for Red Dirt. She is a theatre director and teaching artist focused on creating work that reflects the immediacy of our current social, cultural, environmental, and political life. Her work attempts to excavate the collision of all the minds and bodies in the room to generate a collective story. UNM Theatre Faculty member, Shepard Sobel directs El Matador. Until moving to Albuquerque in August 2009, Sobel was artistic director of New York’s Pearl Theatre Company, which he founded in 1982. He now teaches theatre at UNM, and has taught at CNM and Santa Fe University of Art and Design. MFA candidate Rafael Gallegos’ Have a Good One, tells a story about Theresa’s One-Stop Shop, a staple of life in Albuquerque's Old Town Plaza forever, but the streets are under construction, the tourists are gone, and now Joe the Texan has strolled into town with his “big ole truck” and Stetson hat collection. Gallegos is an interdisciplinary artist with a focus in writing and directing for performance. In the MFA program at UNM, Gallegos has written Solo Aqui, West, and Y’all Havin’ a Good Time Out There? Staged readings of Have a Good One will be April 12 and 13 at 7:30 p.m.